A spawning rainbow trout, like those found in the Truckee River. Seventy-four percent of California’s native trout and salmon are headed for extinction in the next century, and 45 percent could disappear in the next 50 years if no action is taken to alter the trend. 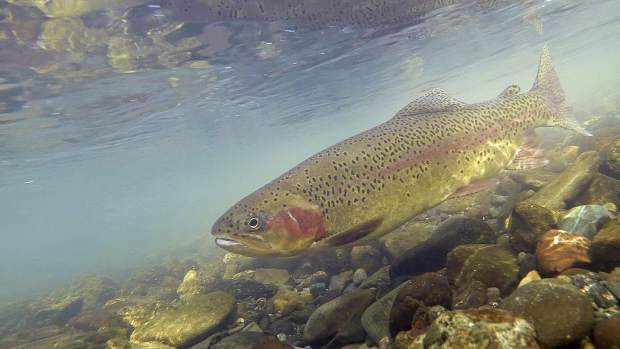 A report released May 16 by the University of California, Davis and advocacy group California Trout details the continued decline of the state’s 32 species of native salmon, trout and steelhead, and proposes for solutions for stabilizing the species. 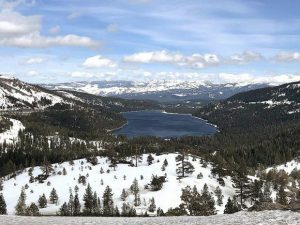 “There are more than just resident fish,” said California Trout Executive Director Curtis Knight in a press conference. Researchers started with an initial report in 2008 that assessed the health of each of the fish species. The recent report, titled “State of the Salmonoids II: Fish in Hot Water,” used the data from 2008 as a baseline for comparison. “Nearly half of California’s salmonids are already listed under the Endangered Species Act as either endangered or threatened,” said CalTrout Conservation Program Coordinator Patrick Samuel. The Kern River Rainbow Trout has a particularly high risk of extinction, and the California Golden Trout is also considered likely to be extinct in the next 50 years. As for what’s causing the greatest threat, climate change was found to be the “major, overarching anthropogenic (human-caused) threat affecting salmonoids in California,” according to the report text. The main problems caused by climate change identified in the report are lack of cold water, low and variable stream flows, constricted habitat, reduced habitat, food web alteration and rising sea levels. It also says that salmonoids can adjust to natural environmental changes, but are less adaptable to human-created threats. After climate change, other major threats found were major dams, agriculture, hatcheries, habitat alteration, non-native species, and fire. He said that CalTrout and the UCD Center are using the information to advocate for the protection of the most productive river ecosystems, increasing the focus on source waters and restoring function to altered habitats. “This report should rightly be considered an alarm bell, but it should also be seen as a roadmap for how we can correct course to better support native aquatic species. Thanks to ongoing scientific research, we now know what to do, and where to improve the plight of native fish,” said UC Davis Center for Watershed Sciences Associate Director Dr. Peter Moyle in a statement.